For most pet owners, an online doctor visit for their four-legged friend can't wait until Monday. People tend to hold off on researching their own health problems until the next weekday. JustAnswer’s data tells a lot of interesting stories. Some of the data shows pretty much what you might predict, such as higher traffic to our car Experts on weekends, and more questions about small engines during the summer lawnmowing months. But it also shows us something a bit unusual: When it comes to human health, customers, like most Internet users, are searching for information most heavily Monday through Friday. Even when it’s something really troublesome, perhaps even worth an ER visit, customers seeking advice from the medical Experts with online doctor visits or research through existing answers start big on Monday, trickle off gradually throughout the week, and have something else to do altogether on Sunday. Meh, that stabbing pain can wait until tomorrow! But when it comes to our pets, it’s exactly the opposite. Veterinary Experts see the most traffic on the weekends – because Fluffy’s health is too important to let it slide until tomorrow. No matter what time of year it is, the traffic pattern remains the same. Here’s a look at three months of traffic in the medical category, clearly showing the Monday-Sunday downhill trajectory. And in the veterinary category for the same time period, this time with the peak on Sundays and the low point on Friday. People who make it their job to know these things – Internet marketers – tell us that Monday, Tuesday and Wednesday, in that order, are the busiest days on the Web. And in addition to those seeking JustAnswer’s medical advice, that also holds true for most other JustAnswer categories, except for those where you’d expect weekends to be busiest: car repair and home improvement. Yet pet lovers have turned this on its head. Whereas people can contact their real-life doctors during the week, they still follow the general Internet trend of researching their health questions online at the same time. They’ll wait until Monday … or Tuesday … or even Wednesday – even though they could just as easily call their real-life doctor. But if Gizmo the hamster is feeling out of sorts, there’s no waiting. Based on the questions JustAnswer sees, there could be several reasons for this. One, people just love their pets so much that when their dog has diarrhea on the weekend they can’t bear to wait until the vet’s office opens, whereas they’re more willing to take a chance on their own health and wait. On the other hand, most of us don’t know how to treat sick pets on our own, so we need access to an online vet when the brick-and-mortar clinic is closed. But we do feel comfortable taking over-the-counter medications or home remedies for ourselves without professional guidance. Alternately, pet owners could be seeking a second opinion from an online vet, either by asking their own question on JustAnswer or by reading existing answers, on a Sunday night, before going to the the trouble and expense of getting their pets to a 24-hour emergency clinic. And they may just take themselves to the ER on a Sunday without a second thought, and have no need for an online doctor visit or research. Researching human health information online is actually one of the most popular uses of the Internet. According to a Pew Research Center study, 80 percent of Internet users, or about 93 million Americans, have searched for a health-related topic online. Help is just a few clicks away when Benjy the beagle is feeling low. In fact, the trend line for consumers’ reliance on the Internet for health research is so steady that Pew’s Internet research arm stopped updating it in 2006. Meanwhile, another survey showed that 56 percent of Americans who researched they health symptoms online have then offered their own diagnosis to their doctor. The same study found that 62% of Americans researched prescriptions drugs online, and almost half asked their doctor to prescribe or discontinue a drug based on the information they found on the Internet. At the same time, we know that many pet owners actually turn to online vets regularly, largely because speaking to a vet online can help them decide if it’s worth dragging a sick animal to a brick-and-mortar vet, and can also offer ways to make an animal more comfortable in the meantime. Online veterinarian doctor visits can be much less expensive than real-world visits, where the vet has to pay for an office, infrastructure and staff. 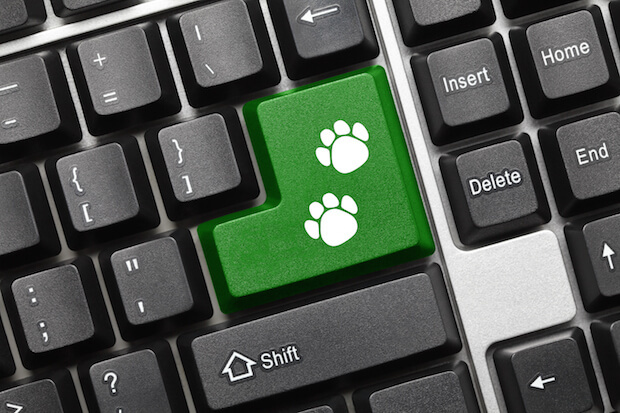 A 2011 veterinary care usage study showed that Internet pet sites have indeed proliferated in recent years and get plenty of traffic. About 39% of pet owners say they will try an online vet before calling their brick-and-mortar vet, according to the study. At JustAnswer, data currently shows an average of some 2,450,000 visitors a month to the online veterinary Experts and the questions they’ve answered – starting heavily on Sunday night, as noted above. All in all, it’s easy and convenient to seek out an online doctor visit for either you or your pet. Just remember, if you’re going to research your own medical symptoms online – whether during the week along with everyone else, or even on the weekend, when you’re in small company – it can pay to actually speak to a medical Expert who can answer your specific questions, follow up with questions for you, and ease your mind. Do you use the Internet to research your health symptoms? How about using an online vet? Please share your thoughts on this in the comments below!